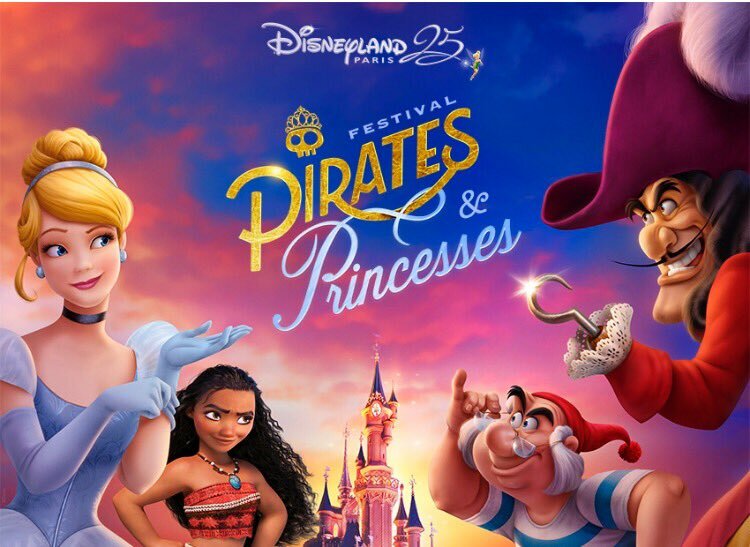 From March 31 through May 31 2018 Pirates and Princesses will take over Disneyland Paris during The Festival of Pirates and Princesses. This new event takes place for the very first time in 2018. Your entrance ticket includes access to The Festival of Pirates and Princesses. 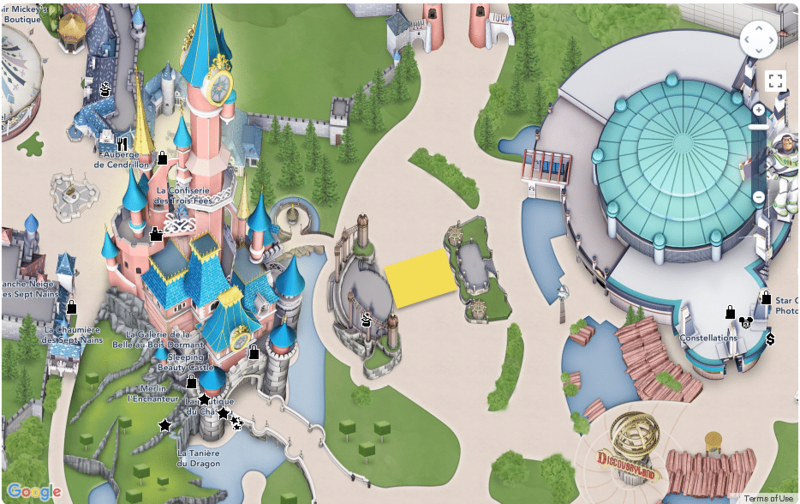 Make sure you check the Disneyland Paris website for great offers on tickets and hotel packages. During The Festival of Pirates and Princesses young guests can become a princess or a pirate. Budding buccaneers can get their face painted and look shipshape wearing seafaring garb fit for Cap’n Jack Sparrow himself. Princess gowns await at the likes of La Chaumière des Sept Nains and Pirate outfits can be unearthed in shops such as Le Coffre du Capitaine. 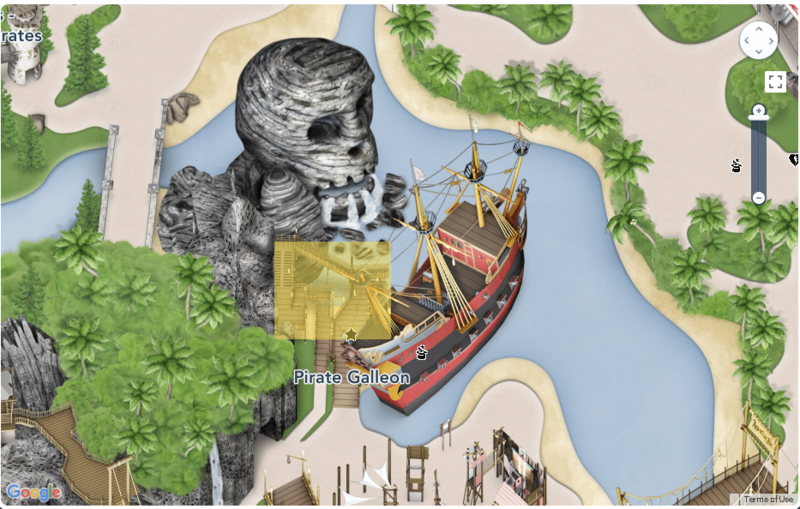 You can meet your favorite Pirate at their meeting point at Pirates’ Beach, among others, near Captain Hook’s galleon. 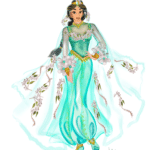 Or meet your favorite Princess in the Princess Pavilion. 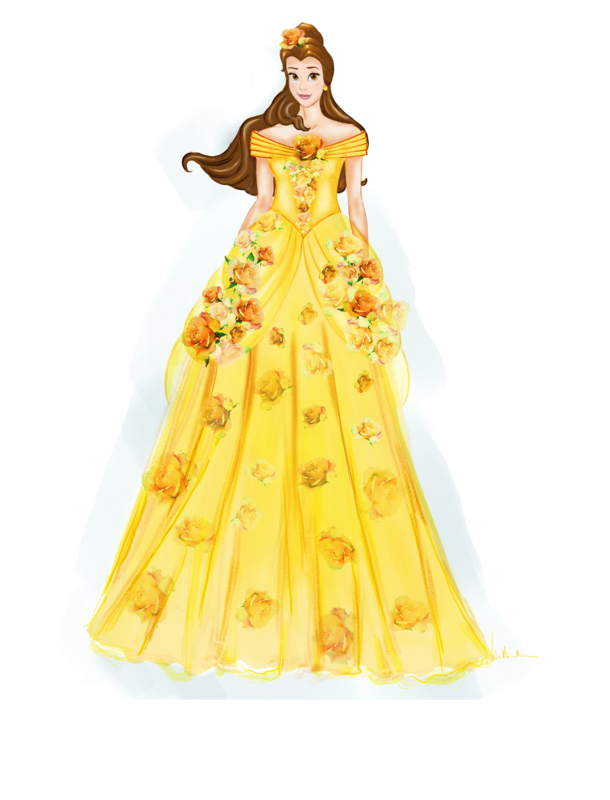 For The Festival of Pirates and Princesses, new dresses were been designed for the Princesses. 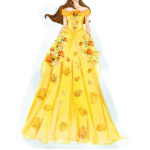 Below a preview of the new dresses for Belle and Jasmine. The two worlds will merge several times a day. Setting off from opposite ends of the Parade route, both the Pirates float and Disney Princesses float stop halfway and immerse guests in a musical celebration. Then, the floats will head to Central Plaza where they’ll come together for a spectacle of guest interaction. On the Princesses float, guests will see the Princess heroes, like Cinderella and Belle. You will also see more recent favorites, like Rapunzel. 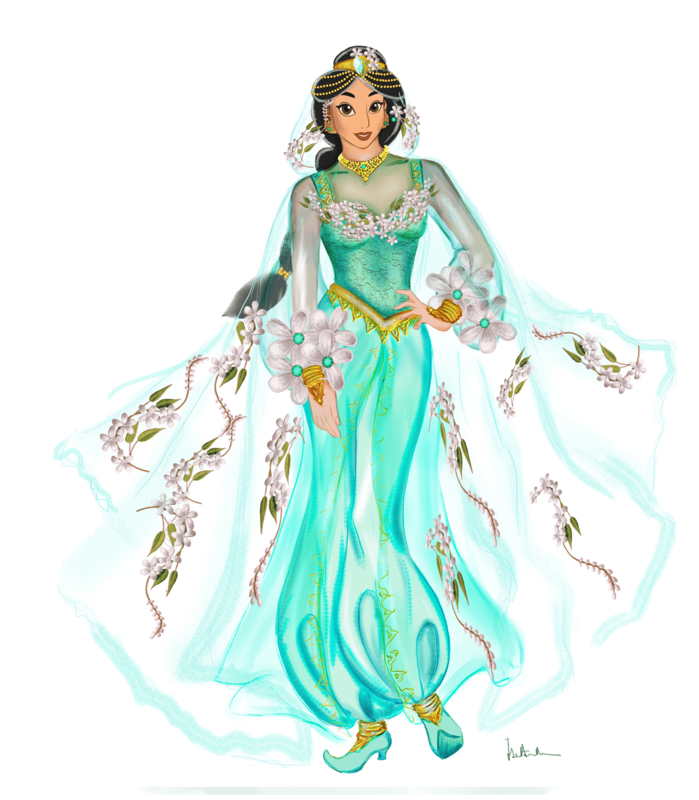 Christophe says, “There will be nine Disney Princesses in total, as well as Moana—and they will be joined by none other than Mickey Mouse!” They will be surrounded by a troupe of dancers in costumes bursting with flowers and other natural sculptures and will be celebrating the Fantasyland world, where dreams come true. On the Pirate side, a huge galleon will sail down Main Street, U.S.A. Captain Hook and Mr Smee will be on-board, up against Peter Pan and Wendy… as well as Minnie Mouse in her best buccaneer outfit! “New Characters also join this crew, including the hero from Disney Junior’s Jake and the Never Land Pirates, who will sail by on the hull of his ship!”. An acrobatic crew of pirates can be seen leaping from one mast to another or up into the air, making this spring cruise a joyful, musical adventure celebrating the spirit of Adventureland. Next, it is on to Central Plaza, in front of Sleeping Beauty Castle, where everyone converges. Guests are then invited to choose a side and take part in one of the two routines, Pirates or Princesses, along with their favorite Disney Characters, all to the same playful melody, paying homage to Disneyland Park. Disneyland is the only place where the two worlds can be enjoyed in unison! “And because the brand-new show will be on a couple of times every day, nothing is stopping you from coming back and switching sides later in the day! Both adventures have a little something everyone!” Christophe adds. Below you can see the program for the first week of this new festival. While times might change, the overall program will stay the same. You can always download the latest program here. Several times a day, the Pirates and Princesses will make their way down the Parade Route. They always start on opposite sides, depending on the time of the show. Normally the first show will have the Princesses start at Fantasyland, and the Pirates at Town Square. Before the floats reach Central Plaza for a ‘dance off’, they both make a stop. Depending on the starting location this will be in front of Walt’s on Main Street USA. Or at the Royal Castle Stage. See below the best spots to watch the different shows. For Festival of Pirates and Princesses new stages have been installed. These can be found in the planters at Central Plaza. To get the best view, make sure that you are on the center of Central Plaza when the floats start at their respective starting points. Most of the dancing happens towards the center. See the yellow marker for the best spots. For the best unobstructed view, go stand at the fence of each planter. Watch the different shows. While you can see both floats and all performers at any spot along Main Street USA, the best spot is near Walt’s, Main Street Motors, or Market House Deli. On the side of Walt’s, there is a reserved VIP viewing, so you might want to steer away from that. See the yellow marker for the best spots. Watch the Princesses dance on Main Street USA. While you can see both floats come down the parade route at Fantasyland, it is best to grab a spot near the Royal Castle Stage. A full show is shown there and it will add to your experience. 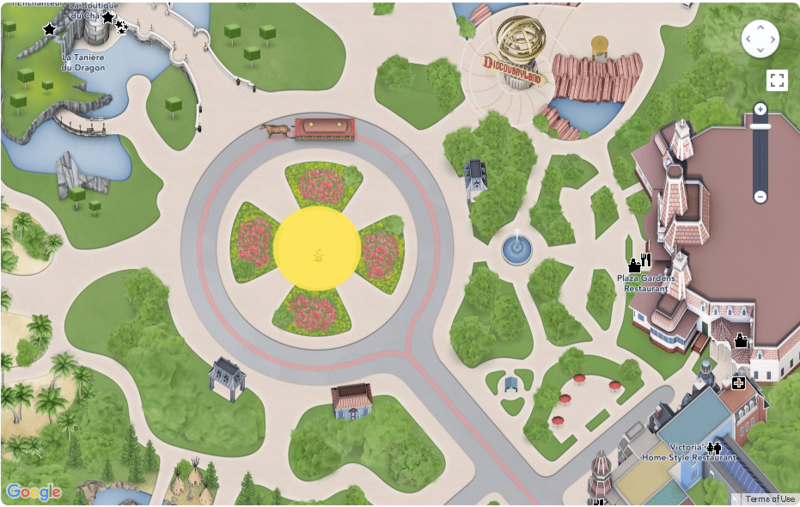 While you can see the show from anywhere in front of the Royal Castle Stage, ir is recommended to find a spot directly in front of the stage. As floats are parked in front of the stage, especially for the #teampirates, it can be hard to see the entire show. While you have the ‘balcony’, this is often used for VIPs to view the show. Watch the Princesses and Pirates on the Royal Castle Stage. The time in the program is the starting time from when the floats start at Fantasyland or Main Street USA. It takes about 5 minutes before they reach the Royal Castle Stage or Walt’s, after which they will give a performance go to Central Plaza. It can take up to 20 minutes before the floats reach Central Plaza. So be patient! The Pirates show Hoist the Flag, Mateys takes place in front of the Pirate’s Galleon. Space here is really limited and we suggest you to arrive on time. On a few people can sit on the floor and the rest has to stand either the stairs or the different levels. 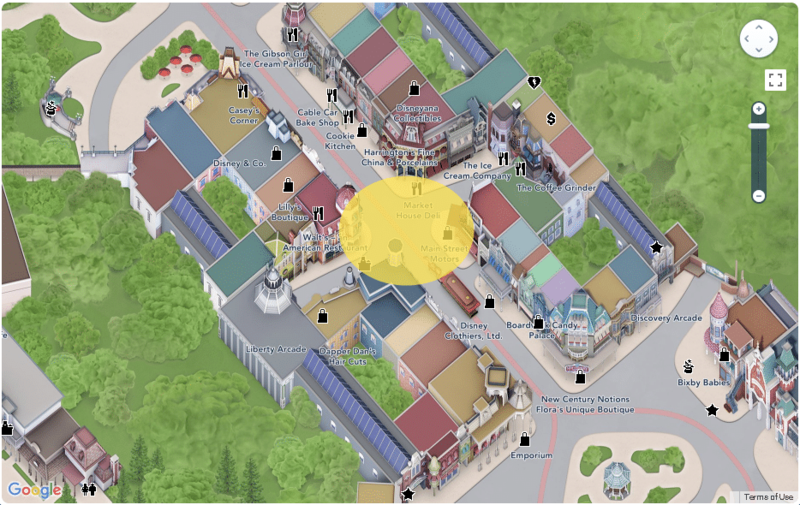 While you can see the show from anywhere in the yellow marker, views might be obstructed by other people, or the wooden frames of the area. Watch the Hoist the Flag, mateys show. When the floats enter Central Plaza guests can join into the fun and dance along. Pirates and Princesses have their own choreography. To get the best deals on hotels package during The Festival of Pirates and Princesses make sure you visit the Disneyland Paris website. You need help deciding which hotel? We got you covered. PrevVIDEO: Hoist the Flag, Mateys!